We have come to realize in our work of backing young horses that the most important stage in the whole process is the change of leadership between the trainer on the ground and the rider in the saddle. It seems that because this stage is so delicate, often it is treated as more of an unavoidable 'jump' than a straightforward gradual process. This is certainly the way we used to address it. We would spend many months preparing the young horse for a rider, and many weeks habituating the young horse to the rider sitting on, but after we felt that all was well and the young horse was calm and accepting the rider's basic presence, we would then go out on rides accompanied by experienced horses, and the 'aids' would be learned by the the youngster almost by default. This worked quite well because on a road the direction is indisputable, so the road is a good substitute for the riders legs until their purpose is understood by the horse, and the baby horse would naturally follow the leaders until the idea of listening to the rider was assimilated. This method is not without value, although it relies on the natural timidity of a young horse which allows the process to stay reasonably gentle and controlled, so there is no necessity to use the reins as an emergency brake. More recently however, we have been discovering how a more integrated process of transferring the 'control' from trainer on the ground to the rider can fill in all the gaps. Our training process relies on the ability of the horse to assimilate the rider's weight and transfer it into a different balance, which then allows the horse to respond to the rider's postural aids. 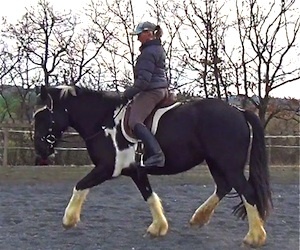 These aids come from the seat, leg and upper body of the rider, in order to balance and collect the horse's movement. The reins are only used as a passive form of aligning the neck of the horse along with their body, what we refer to as 'positioning'. They are not used to control the forwards movement. So when you have a young horse which is not yet confirmed in the physiological responses required to come back to the riders seat, leg and torso aids, how can you keep this horse within a balance where they are able to carry the rider without rushing or panicking, or even without the problem of reluctance to go forwards properly? 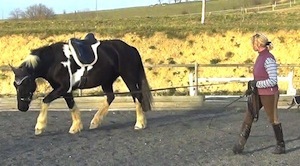 Most trainers simply pull the reins whenever they need to slow the tempo, and the young horse learns quickly to fear the bit and back themselves off it, and at the same time they learn to drop their back and leave the hind-legs out behind, because this is the only choice a horse has when they have to stop suddenly to protect their mouths, and they are not well developed for collection yet anyway. When a young horse is, on the other hand, sluggish and reluctant to go forwards, the rider is usually obliged to use very strong leg or even whip aids - far from the ideal introduction to the aids. There is an alternative to this less than ideal scenario: simply to keep working the horse on the lunge for a sufficiently long period once the rider is on-board. Familiarisation with the rider sitting on the young horse. The rider's presence is often quite a shock for a horse, but there is so much stimulus at first that the youngster will tend to accept without reaction. What people often think of as the horse 'testing the boundaries' later on is more of a delayed stress reaction when the horse has come sufficiently out of the shock to react. Taking enough time and gaining true trust at this point pays off in a very big way later on. I would say that most horses find being ridden a stressful experience throughout their lives, stemming from a rushed start. Receptivity of the young horse to the riders aids. This rarely comes straight away. Once the familiarization process is well underway, the horse starts to be able to open themselves up to the communication from the rider. 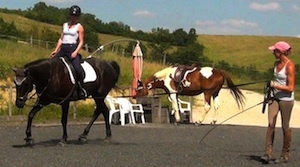 They need to be able to rely on the aiding system they already know (from the trainer on the ground) to keep them balanced and feeling secure so that the rider never has to do anything disruptive or insensitive (therefore introducing tension which disturbs the patterning of the nervous system). The aiding from the rider is gradually merged with the ground trainers aiding, and accepted and eventually understood by the young horse. 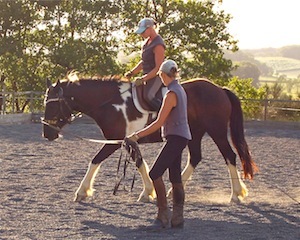 Once this receptivity is coming well, and the youngster can 'hear' the rider's seat and posture and become habituated to being balanced and engaged, that is when the trainer on the ground begins to take a back seat and the structure will be in place to safeguard the young horse's mouth. Crystallisation of the partnership. This will then continue for the rest of the time rider and horse work together. If it has been carefully nourished and developed out of the right foundations, then it has every chance to flourish because the pattern of positive experiences and safe time together will continue to reinforce itself in each session, as long as problems which arise are addressed in non-forceful ways. The same idea of integration can be employed when introducing horses which may not be used to the company of others, into a herd. While allowing them the support of their own space - this can be a small inner paddock or field - the rest of the herd can circulate around the edge. When it is clear that the horse which lacks socialization has begun to make relationships and no longer needs the retreat of their own space, the gates can be opened and the herd can be allowed to find it's balance as a whole. Horses' ability to rehabilitate themselves is sadly underestimated. The therapeutic power of the herd is priceless and can resolve problems in a matter of days which might be impossible to change over years of training. Even if you aren't working with a young or inexperienced horse, it is an interesting exercise to ask someone you trust to lunge your horse while you ride. Take away your reins and check out how well your horse responds to your seat and postural aids. Does he/she tend to rush or lose balance? Are they willing to come back to your seat and legs? This is also a good exercise for yourself to practice balancing in sitting and rising trot without reins, and to make sure no habits are creeping in which are influencing your independence from the reins. Make sure you are able to keep your weight central, and you are not losing balance to the outside. Without the reins these dynamics become clearer. 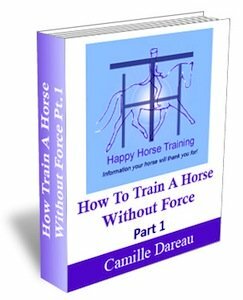 For more detailed information about lunging, go to Lunging A Horse Well and for a complete guide to all work on the ground based on these principles see the HHT eBook: How To Train A Horse Without Force Pt. 1. Join the HHT group on Facebook! The first part in HHT's Training series: How To Train A Horse Without Force. This quality e-book gives you a unique holistic understanding of training horses, from the very first contact with a young horse, through to a thoroughly explained method of lunging that is beneficial for any horse, not just in preparation for first riding, but at any stage of training.